Here's one for you, sunguar! First time I remember seeing this angle. Nice, Bill. I've not seen this angle either. 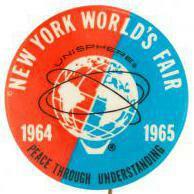 The best one I've ever seen of the entire Fair (in color) is the one between the front cover of "The Fair in 1965". It's actually worth the price of the book. I've give my eyeteeth to have the color slide of that one (or one similar). This slide (and others) shows the limitations of the Monorail. I know there was original discussion of having the Monorail go around the entire perimeter of the whole Fair, but this was shot down. But couldn't they have at least have the thing loop around the outside of Hawaii and the outside of Florida and then go behind the Amphitheater? No wonder the Monorail wasn't a big hit. And do I see the Empire State off in the distance? Cool angle on that photo. GM and Ford were massive structures. I think the photograph captures the limitations 1964 planers had in their effort to conform to the 1939 design of the grounds. It's also evident that the monorail was a lost opportunity. What could have been a people mover and a transportation breakthrough was relegated to the amusement zone and the monorail was little more than a carnival ride. A helicopter over the Texas Pavilions. I believe so, and it's where Carousel Park was. Looks like the ground had been freshly cleared for it. The early official visitor's map shows a bunch of tepees at that location. Depending on which version of the map you look at, the area slightly to the right of the proposed American Indian Pavilion (and it looks like they actually were going to have a Pavilion along with the Tepees), is first labeled "Kiddyland" (1964) and at some point changed to "Funland" (1965). I not quite sure why the name change occurred. 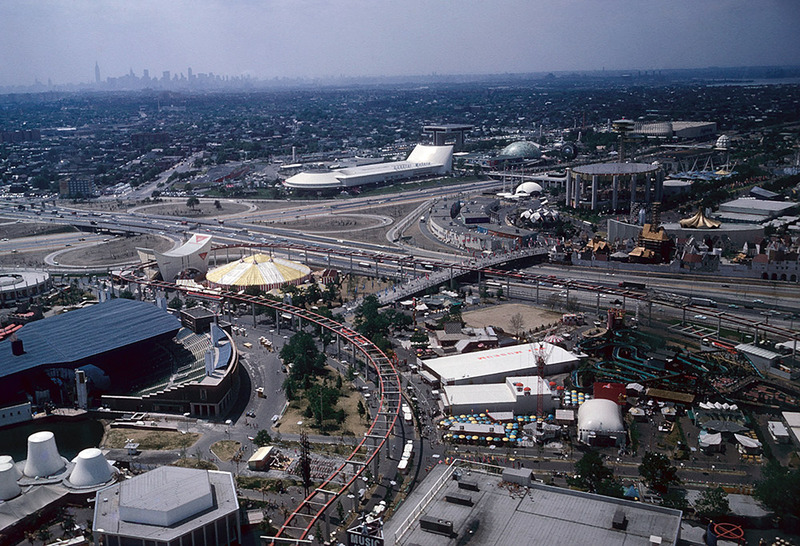 The area where the American Indian Pavilion was to be evolved into "Carousel Park".